The description next to the part number says "Sheave, 7x3/4"
You see black around the edges of your eyesight... Now you have to question everything! Is the world truly spinning, or is it just you? How have you gone your whole life calling this a drive pulley, if it's really a sheave? What is the difference between a pulley and a sheave? 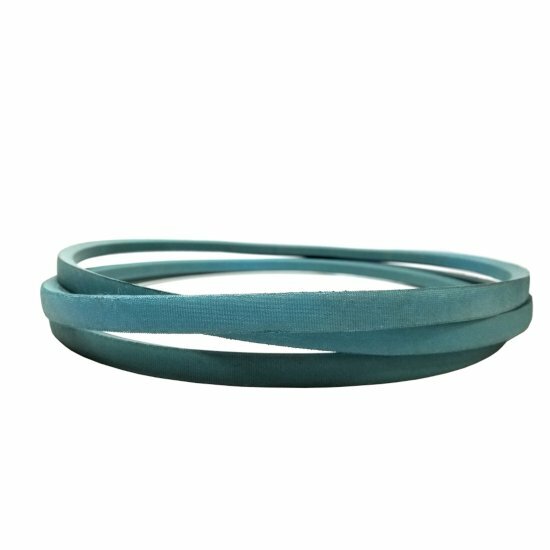 You may have noticed that we recently added a whole new product line to our already formidable offering: Lawn and Garden V-Belts! Apart from these belts in general being a bit longer than our rubber v-belts, there is one very apparent difference: They're blue. What's so special about these belts? They are wrapped in Aramid cord and are designed for use in heavy duty applications. But what is aramid? Why is it so great, and why do aramid cord belts look just like Kevlar®? Up here in New England, we've had piles of snow on the ground since well before Thanksgiving. That means our trusty snowblowers have been working hard for months already, and odds are they'll be needing a nice tune-up pretty soon. Those of us who get a lot of snow know we've got to take care of or snow throwers, else we'll be up at the crack of dawn with nothing but a shovel and our own aching bodies to clear a driveway that seems to get longer the more we clear. First things first, you may have noticed that on this blog and throughout our site, we use the terms snowblower and snow thrower interchangeably. As it turns out, that may not be strictly accurate. Okay, everyone, we've gone over the two most important questions someone could have while visiting our website. Now let's compare the two... which does what? 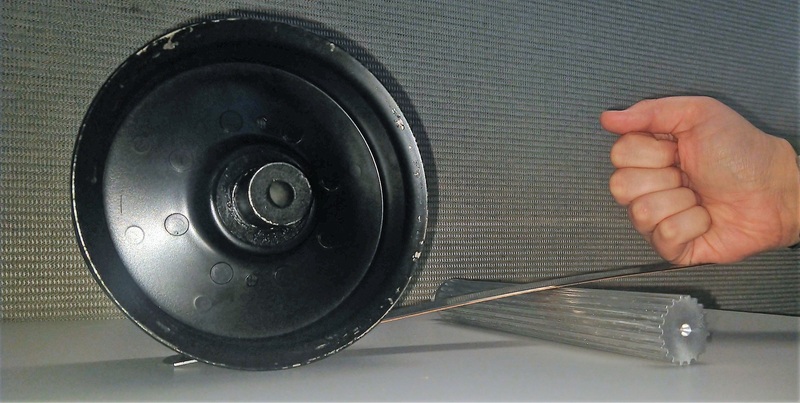 How do idler pulleys and drive pulleys work together? What do idler pulleys and drive pulleys look like? Which one would win in a fight?! So you know you have to replace a pulley on your snowblower because of some extensive online research, but you're not sure what kind you have. At first you thought maybe it was a drive pulley, but after looking at it closely, you can tell it's got some pretty key differences. The root of the word "idler" has a couple of different meanings - the one most of us use daily refers to people who are lazy, or activities that are pointless. I have good news for you, idler pulleys are neither lazy nor pointless, and if you take all of the idleness out of your lawnmower, it will break! Let's get our bearings together and find out all about idler pulleys! You know the thing you're holding is a v-groove drive pulley because that's what your owner manual says. But what is a drive pulley, anyway? A drive pulley is a pulley that is attached to a power source, that when in use puts force on a belt (or cable or chain). The belt is connected to an output, which will then spin. This is called power transmission. All by themselves, they won't give you the drive to wake up early and use your snowblower and clear the driveway, but used with other components, they'll sure make the job easier! You care about your zero-turn mower’s wellbeing – it’s been providing a smooth cut of your grass all summer – making your lawn the envy of the neighborhood. So you know it deserves a good thorough cleaning before it beds down for winter. Did you know that grass stops growing at around 50 degrees Fahrenheit? Up north in the beautiful White Mountains, New Hampshire has just had its very first frost of the season: No mow summer for us, that’s for sure. on nearly every item in our store! We know you don't want to be spinning your wheels while you wait around for your parts - that's why we've found new ways to get your order to you faster than ever before, without having to drive to a store! All of our Genuine OEM Replacement Pulleys for the brands you love like John Deere, Husqvarna, MTD, and Toro, have free shipping, no offer code needed! Orders will be delivered within 1-4 business days, and most will arrive in just two! We bet it won't take too long for our customers to (Bore) adapt to fast, free, shipping. But what does it mean when we say "nearly" every item ships free? Nothing scary, we promise! What do all the terms for pulleys, bearings, and belts mean? Throughbore, offset, flanges, diameters, shoulders... It can be tricky navigating all the technical jargon thrown around when trying to pick out your perfect replacement product. While we have a handy guide on how to measure your pulley, sometimes what is needed is a nice detailed description. Here at Phoenix, we get a lot of calls to 1-800-776-9315. 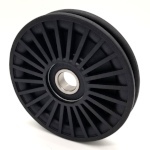 People wanting to make sure they have found the right Genuine OEM Replacement Pulley for their Scag mower, needing help measuring their pulley, or wanting to verify stock on our timing pulleys. We love these calls. We are happy to help with these kinds of questions at any hour of the day. As discussed in the previous riveting article, there are really two main pulley “types”. See "What is a pulley?" for more info. The most commonly seen in your day-to-day is the pulley used to move objects from one place to another, typically in block-and-tackle format and using a rope or wire that is pulled. For example, if you've ever gone zip lining, you might have been using a system sort of like that. Have you ever heard of a simple machine? It’s something you might have been quizzed on in middle school, but don’t worry, just by reading this blog, you’ll get a gold star for the day! Every day, you interact with simple machines, from opening your bedroom door (wheel-and-axle doorknob) to using a knife to slice your bagel (wedge). 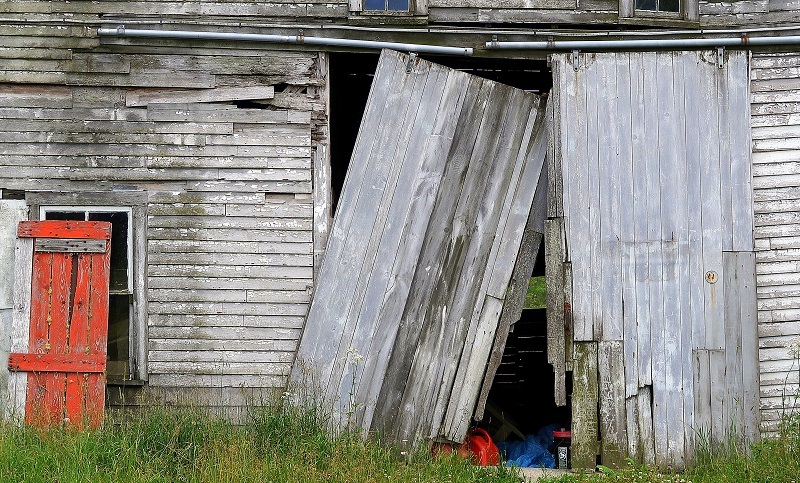 Do you have an old barn with a busted door hanging on old, clunky rollers? Or, similarly, an upscale loft in the middle of an urban landscape, but you've been thinking about how you'd like to be more country retro-chic on a budget? You're in luck! We have pulleys that can help! When you’re searching for a general purpose drive or idler, the most difficult and confusing part can be determining how a specific pulley will work with your belt. Most of us are not designing machinery to precisely traverse interdimensional portals into alternate realities. Probably. So an engineering degree is not necessary to pick out most replacement pulleys. It’s all over our site, it’s all over every site you’ve looked at so far this morning on what is turning out to be more annoying than that homework assignment you didn’t do in high school. Genuine OEM Replacement. What’s it all mean? Why does it matter? Let’s get into some weeds and rip them outta the dirt. Many of our customers are building custom jobs in their workshop or fixing their busted equipment. Electric motors, fan systems, compressors, old lawnmowers, or innovations in perpetual motion? Sometimes a standard pulley is just not going to work. Phoenix is your one-stop for idlers and drives, sure, but we also don’t want inventory rows that go on and on forever. 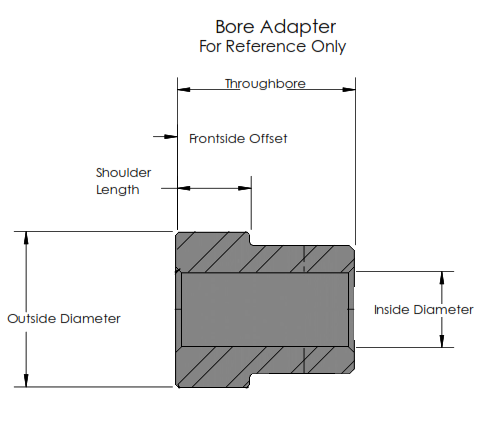 This brings us to the happy solution: Multiple Bore Options. What does it mean for you? How does it work? Why do we have so many options? Let’s bore deep into this topic! Filter your Search results for the Ultimate in Pulley Choice! It’s the long awaited sequel to the smash hit, How to Find the Right Replacement Pulley: Trim Down Your Search Results! Let’s say you’re working on a new project and don’t have one specific pulley in mind. Maybe you have an inch or two of give on the Outside Diameter of your drive sheave, but it has to fit on a 1” shaft. Unfortunately, searching for “5-6 drive 1 ID” isn’t going to get you any useful results. The internet might think you’re looking to go somewhere on May 6 under an assumed name. So, you’re looking for a pulley, and finally, you’ve come to the right place – Phoenix: Pulleys Bearings & Belts are the experts you’ve been dreaming of for years, we’ve got more pulleys for sale than you can throw a belt at! You may have been searching for hours by this point, and are plain fed up with the internet in general - so we’ve compiled here a few tips for navigating our site to take away some of the tension you’re feeling. The good news? You’ve already completed Step 1 by coming to the best place online for replacement pulleys in lawn mowers, snow blowers, and small engines. Welcome to the New Phoenix Pulleys Website! We at Phoenix Pulleys, Bearings & Belts have had a busy past few months! We know you love ordering replacement parts from Phoenix Pulleys and we've made upgrades to our site to make it easier for you!